In what world is it rational to decide that dumping 800,000 ounces of notional gold into the London Fix (or COMEX open) makes sense? In the space of 4 minutes, almost 2 million ounces notional were flushed into the gold futures markets dumping the price of gold to 3-month lows. This is the 4th down-day in a row and yet another “spike” around the open/close that regulators remains ignorant of. [Note: Most investors, when they sell, attempt to get the highest price possible. Such is not the case when it comes to gold (and silver). Over the past 10-12 years, huge quantities of the metals have been dumped in what can only be efforts to manipulate prices lower, action that is not unprecedented. [In the late 1960s, the London Gold Pool was formed by eight Western central banks in an effort to keep the price of gold from rising. Although the Pool officially lasted for eight years, it collapsed as other central banks turned in paper dollars for hard assets, draining the gold allocated to the Pool. [In the 1970s, the US Treasury and the International Monetary Fund made another effort at suppressing the price of gold, driving it from the $200 level to just about $100. However, that effort also failed, and by 1980 gold had hit $850 (and silver $50). “There are no free markets anymore in P.Ms. There are only manipulated markets”. Time will tell when the natural order of Supply and Demand will resurface. No one should look to the world’s regulatory agencies to do anything about this bogus market and it’s electronic manipulations. The establishment and its minions have unlimited amounts of money and will keep this up until the dollar collapses and they run out of ammunition. Who knows when that will happen? Can anyone tell me whether the establishment running out of gold will be the tipping point or the above? There is no country where gold is a recognized form of money today. That could change tomorrow, but today gold is not money. So as far as the definition of money is concerned, gold fails in the “medium of exchange” category. But, does it act as a storehouse of value. Can it really absorb the units of labor that a person has expended on the job, and keep the value created from that labor in a safe place until the worker is ready to exchange it for goods and services? Judging by the last few years, the answer is yes! Gold may have done a much better job of storing value than any currency has. You can see this by looking at the prices of commodities, which go up when among other things, the value of currencies decline. The problem is that beyond some very limited uses for adornment and industry, gold is used for nothing. It is not consumable, edible, or an input of any kind. Gold just sits there. Right now gold is relegated to the role of storing value, and gold’s ability to store value is determined by whatever investors think at the moment. The value of gold is whatever “investors/banks, etc. think it should be” at the moment. Gold is not exchanged for wheat, oil or coffee. The value of gold is something of a mystery that is solved each day as investors look across the economic landscape and determine how comfortable they are with the U.S. dollar, the yen or the euro. If it appears that governments are being responsible with their currencies, then the value of gold tends to fall. If governments are pursuing reckless policies, say, printing trillions of new units of currency to pursue some unreachable goal, then gold tends to rise. This is where we have been. Over the last several years we have seen things that seemed impossible. The Federal Reserve printed trillions, the European Central Bank (ECB) printed and lent trillions of euros and the Japanese, well, they have been printing like crazy for two decades. The outcome has been a wild ride higher for gold. However, none of that means that gold will zoom to $2,000, $2,500 or even $3,000. What would seemingly drive gold to such heights would be a continuation of these policies. **(What if instead of printing more currency, governments allow the restructuring of debt that economies around the world so desperately need?) What if the events across Europe become catastrophic? All of these things would, after the dust settles, make currencies more valuable, which would drive down the value of gold. Given that the gold rally is several years old at this point, and that countries around the world are chipping away at their economic issues, now is the time to pare down some of your gold holdings that have appreciated so nicely. When tomorrow comes, who knows what people will think gold is worth? Jay, my understanding is that since 1971, when Nixon closed the gold window, OPEC has been setting the spot price for oil in gold and then converting it to US Dollars. What we are seeing now is a replay of the Great Depression. Gold will hit bargain basement prices and in a concerted effort, investors will short the stock-market and buy gold. They will again reverse their positions after the reset and buy any remaining stocks for pennies on the dollar. Anybody remember FORD at $1.04 just a few years back? Is there a connection between last Fridays 2 million ounce sell off of gold to the $13 billion penalty agreed by JPM organ Chase and the DoJ and announced same day? This looks like panic selling in anticipation for the strengthening of the dollar, and the euro, with the possibility of inflation. 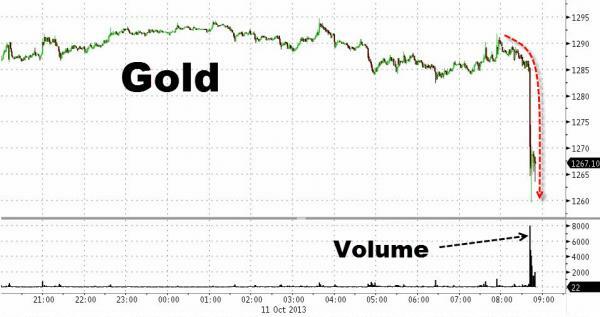 With the temporary support of U.S. government to avoid shutdown, this may be a factor in the dumping of gold. This is a panic discount of the economic conditions, similar to Wall Street, which discounted the avoidance of U.S. government shutdown, before it happened! With the manipulation of the gold market, this is an attempt to disconnect gold from the European economy to re-establish the euro and help the European countries in trouble. many uses other than adornment and is being used faster than it is being mined. the near future and is usually 60 times cheaper.